We can transform the home you have in the Lake Norman, NC area into the home you’ve always dreamed of through home renovations. 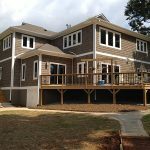 Home Renovations in Lake Norman – If you are considering home renovations for your Lake Norman, NC property, trust our professionals at Chad Goodin Signature Homes. With over 30 years of experience in luxury custom homes, we promise to give your renovation project the same level of superior craftsmanship we give to each of our remarkable homes. From small modifications to major renovations, we can help you see the benefit of every change you make. Many homeowners buy a property for its location and choose to make home renovations after they have settled in. For others, the home that once met their expectations is in desperate need of updating. Whatever your reason, we can transform the home you have into the home you’ve always dreamed of. Our talented designers see the potential in every home, and they are ready to transform your vision into a home you will treasure for many years to come. We understand that home renovations can be inconvenient for homeowners, which is why we work with professionalism and efficiency to ensure your project is completed within the designated timeframe. Our communication lines are always open, and we strive to keep you updated as the project moves forward. We want you to feel comfortable and confident working with us, and we hope you will consider us for all your home renovation needs. Contact us today for more information or to schedule a home renovation consultation. Let us turn your dream home into a reality! At Chad Goodin Signature Homes, we proudly perform home renovations in Mooresville, Cornelius, Davidson, Huntersville and the surrounding Lake Norman area of North Carolina.